When you find yourself yearning for something, but you can’t quite name it – where is that yearning located? You would know if it was food; you’d feel it in your stomach. You’d know if it was a relationship; your eyes would be searching, constantly, for connections to appear. But when you can’t properly express what is missing from your life, your organisation, or your day – what you might call that vacancy – then you can’t easily look for what might fill it. We often face this problem when we talk about the need for a new politics. Because even if we tried to “reengineer” or “reform” it, the basic realm that we call “politics” today is thoroughly inadequate. It is unable to answer the needs we have as a society, for orchestrating, facilitating and realising our shared resources, in service of our collective flourishing. Hence, when we say we want to address a “broken” politics, those who never liked that grey, combative, ungenerous culture of Westminster, turn away with distaste: “No thanks, I don’t like politics”. When we talk about producing better politicians, they might say “nah, I don’t trust politicians full stop”. Yet these same people are not exempt from having problems and demands caused by the structure of their lives. Politics should be able to respond to these problems and demands. If only it wasn’t trapped in the 20th Century; if only it wasn’t designed to serve elites in top-down structures, where those at the bottom can neither be seen nor heard. If this is a body politic, it has very poor circulation. When Uffe Elbaek created first the FrontRunners (a socio-cultural youth organisation built on a circus troupe), then Kaos Pilots (a globally successful hybrid business and design school), it was Alan Ginsberg’s poem, Howl that was driving him. He still refers to Howl when he describes his most recent invention Alternativet (an experimental political party with ten seats in the Danish Parliament, five years after their founding. Ginsberg, along with Jack Kerouac and others, were founders of the Beat Generation. Uffe reminded us that “beat” meant not rhythmic but “dead beat”, exhausted from living life on the edge in search of full human expression. This capacity of art to capture what cannot otherwise be easily expressed, and connect an audience to that feeling - that drive - is the reason we also work closely with artists at The Alternative UK. Sitting around tables and accessing only our cognitive powers cannot take us to the same places that artists can. And if we are trying to design new institutions that serve not just the human body but the human spirit too, we need artists and creators’ hands-on help. But it’s not easy to bring artists into the same space as political dreamers like us. The lazy cliché is that it’s like herding cats; the more precise and respectful term is that artists won’t be instrumentalized. Too often art is tacked onto the end of political events (or just before the break) as a departure from the monotony of policy talk. A "political party in residence"
So, it was a stroke of genius when Rebecca Duclos, Dean of the Faculty of Fine Arts and professor in Art History at Concordia University, Montreal, reversed the usual artist in residence idea and invited Alternativet/The Alternative UK to be a “party in residence” over three visits this year. Just to see what happens. As a starting point, we’ve taken the theme “vacancy”. This is inspired by the work of activists Entremise, a non-profit organization focusing on “connecting people without places to places without people”, through the transitional use of vacant buildings. Director Jonathan Lapalme had previously worked on such interesting projects as the Uneven Growth exhibition at MoMA, New York. Or re-conceptualising the role of street vendors, in order to increase urban resilience, with the Street Vendor Project. What might this hugely provocative term inspire in the artists during their encounter with politicians, themselves faced with an empty space – a vacancy - where a new form of politics should be? This first session, concluded this week, was about making friends. We encountered twenty-five students (undergrads, masters and PhD candidates), which included dancers, sculptors, journalists, literature and creative writers, film makers, musicians. They were invited to introduce their own disciplines and describe why they might be interested in the encounter with The Alternative (Danish and British). A theatre student from Lebanon talked about how “the social order of our world is dominated by a small group of powerful people and organizations who set the frame of what is acceptable. Any life outside that frame is portrayed as different and unnatural. We need to construct new spaces that allow us to experience alternative ways of being on all environmental, economic, social and cultural levels”. A film maker from Iran talked about how she documented spaces “which were previously full of hope and life, and now are turning to ruins so that after a while no one will even remember the name of them”. And how this practice gave life to her soul: “vacancies reminds me of the thousands of people who worked and lived in societies and are no longer amongst us and are somehow forgotten”. A dancer originally from South Carolina, talked about the bubble of an arts-driven life and her desire to step outside of it into something more ‘real’. In response, Uffe gave a very visceral account of his life story and how he came to found Alternativet. He emphasized the key role that our private space – our personal vulnerabilities, predilections and archetypes – plays in shaping our destiny. One hilarious episode in his early career was kicked off by a dare from one sassy young woman, who challenged his group of naïve circus entertainers to ‘invade Russia’ – at a time when the Iron Curtain was still heavily drawn. The impossible logistics had nothing to do with their decision to go – they were driven entirely by their desire to impress the girl. A year later, under the title Next Stop Soviet, they had pulled off a major rock concert in Moscow with 2000 young Danes attending (joining many thousands of locals), making history by staying in the homes of local Russians while they worked. The music was a powerful disrupter: and although the activists (who by this time, were many more organisations and events than just Uffe's) felt it would be decades before change would occur, they could feel that change was in the air. Turned out, only a month later, the Berlin Wall came down. The following day Uffe shared some of the tools and design models that Kaos Pilots teach – which had also played a part in bringing the Alternativet party to life. Something started to become clear: the chemical reaction between inner drives and external prompts was the alchemy that the arts and politics shared in common. Maybe we could begin to see the re-making of politics, too, as a major work of art? Not as a discrete task by this bunch of lucky students, but as an ongoing labour of love by the people? Defined not just as citizens, but also as artizens? Over three days, the group visited a number of extraordinary buildings that had been left empty by the city council. The first was the old Royal Victoria Hospital complex - a magnificent sprawl of august Anglo-Scottish design, complete with turrets and arrow-slits (see below). Due to centralisation, all the medical care has moved to new buildings downtown, leaving these spaces well-lit, heated and protected, but abandoned. The empty mental health unit in particular struck a chord. Was that symbolic somehow of an economy which does not recognise the complex needs of human beings? Another visit was to Project Young – another empty building which has temporarily become a civic and collaborative space for the re-imagining of Montreal. A third was the Darling Foundry which has become a temporary art gallery and the site of several arts studios. What might any of these temporary spaces give rise to, when filled with the demands of the Alternative for a new form of political activity? I picked up on this fast-developing theme in my own presentation on the founding and rise of The Alternative UK. I started by identifying my own political drive as a life-long search to understand the human condition and, in particular, to grasp the possibilities of human agency. Is our agency bounded by physical power, or does our boundless imagination actually point to another kind of power that manifests reality? On my own journey for example, from peace activist to soft power consultant, I explored the difference between hard and soft power. The first describes all forms of ‘carrots AND sticks’ from guns to money and even sanctions – anything that forces another to act. Soft power by contrast is attraction – ways of behaving and being (like charisma) but also the powers of framing, narrativizing and confronting through imagery and sound. Where there is attraction, there is the opportunity to influence. Neither is more moral – but soft power is more available to the non-state actor. A picture, a meme can have as much global agency as a bomb (if you doubt that, consider the strategies of terrorists working effectively with internet disruption). This field of exploration is a growing one at The Alternative UK. It occupies the space between spirituality and materiality which some call “vitalism”, or “creative ontology”, or complex-systems “emergence” - expressing a kind of “faith" in possibility and creativity itself. Some kind of shared concept of transformative energy seems to be needed across the spiritual-secular divide. How can we free ourselves, mentally and spiritually, to become more poietic – by which I mean becoming capable of realising what occurs deep within us, in a material form? And is it not the job of politics to create the conditions for all of us to live such full, meaning-driven lives? As we reached for the stars, a number of tensions arose in the room. These were to do with individual freedom, privilege, equality – the identity issues that have also arisen in other recent laboratories we’ve been involved in, including CSOS in Paris and CtrlShift in Wigan (written about in the links). It was very interesting that, among these artists, these tensions were quickly accepted as part of the overall assemblage – vital bits of information for the construction of a work of art if it is going to be true, have integrity. (There are fascinating artistic and philosophical definitions of "assemblage", both relevant). After all, how could we design a new politics that lacked this capacity to embrace and resolve such tensions? "a symbol of our willingness to be vulnerable in the face what might emerge between us"
As we got to our final day together it was clear that the artists and the new (small p) politicians (or were we poeticians, poieticians?) were already in cahoots and ready to jump into the unknown together. 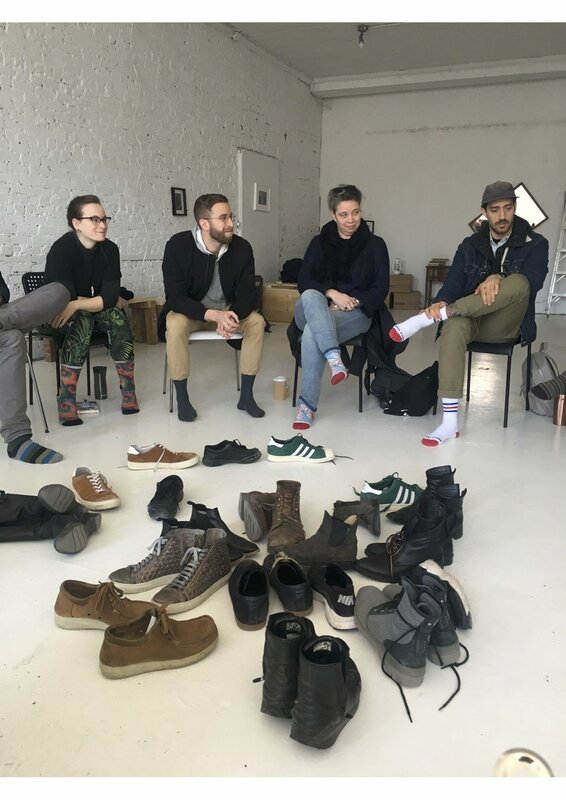 A pile of shoes in the middle of our final circle symbolised our willingness to be vulnerable in the face of what might emerge between us – a certain level of mutual trust was already on display. Our next meeting will be in September, by which time a series of proposals for concrete projects will have arisen from the students, largely on the theme of vacancy. Another meeting in November will see those ideas take form, ready for display, publication or performance. If any other arts institution is reading this and interested in doing similar work anywhere in the world, please be in touch. 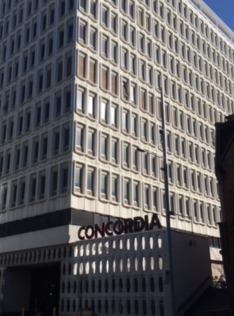 What the pioneers at Concordia have begun is already proving its value for Alternativet and The Alternative UK. It will be a vital piece in our long-term commitment to re-imagining politics.